It’s spring, which means it’s time for me to plant my garden – tomatoes, eggplants, squash, peppers, a variety of herbs and flowers. I’ve noticed that our local nursery offers many plants in a variety of different size containers. For example, you can buy tomatoes in tiny six packs, in single small containers, or in bigger pots. Many perennials are available in small and medium packs, 1 gallon or 5 gallon pots, or even 10 gallon containers. What’s interesting is that the same variety of plant will grow to a different size based on the container it’s planted in. This makes sense because the plant’s roots grow until they fill the available space, then, in order to preserve themselves, they naturally pullback to stay at their current size and not overgrow their containers. If you’ve ever taken a root-bound potted plant and moved it to a bigger container, you’ve seen how quickly it will start to grow and expand to take advantage of its new, expanded space. Put a potted plant in the ground and it will begin to grow even more – freed of the constraint of a container. People and organizations do the same thing. Our goal is to offer the value we provide to as many people and organizations as we can. Our business is 100% referral based, which means we rely on people like you to tell others about the types of results they can get from working with us. If you know an organization that could benefit from more impactful marketing programs, processes, or people, please let us know. 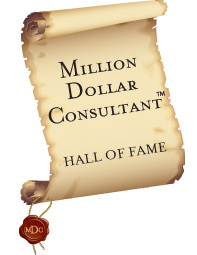 We’re excited to announce that our president, Linda Popky, has been inducted into the Million Dollar Consultant® Hall of Fame. Honorees are chosen from the participants in Alan Weiss’s Private Roster Mentor Program. Engaging in continuing, challenging, personal, and professional development. The Silicon Valley/San Jose Business Journal recently honored Linda Popky as one of Silicon Valley’s Top Women of Influence, for her service as president of Women in Consulting (WIC). This year’s winners include top women in business, government and community service in Silicon Valley. Honorees were featured in a special edition of the Business Journal and feted at a banquet in March. WHAT MARKETING THOUGHT LEADERS ARE SAYING? 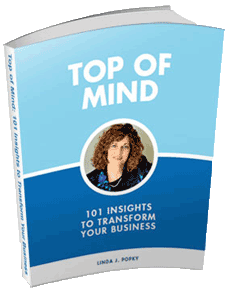 Upcoming guests include Laura Lowell on publishing as a business model, Gary Katz on marketing operations, Katie Payne on social media measurement, and Dave Taber, author of a forthcoming book on Secrets to Success with Salesforce.com. We’re taking it to the web with a new BrightTalk webinar channel. Our first free webinar, scheduled for April 28 @ 10am PDT, features highlights of our recent sellout seminar, Promoting Your Non-Profit. Other upcoming sessions include: Effectively Marketing Your Career in Turbulent Times and When Social Media Doesn’t Work. Register for the webinar. 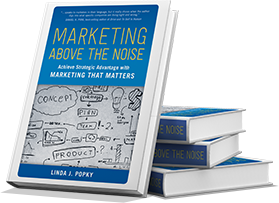 The latest edition of Getting Started in Consulting, the bestselling book for new consultants by Alan Weiss, features a quote from Leverage2Market’s Linda Popky. See more. Linda was the featured speaker at a February seminar entitled “Promoting Your Non-Profit: How Marketing Can Help You Succeed in Today’s Economy.” See our resources for non-profit organizations. Leverage2Market’s Mitchell Finer was quote on stem cell research in a video interview with IVF in Focus. Watch video. Linda taught the Strategic Marketing Perspectives module of the Leadership Excellence program at the UCSC Extension in March. Our podcast interview, Marketing in a Recession: Shattering the Myths About What Does and Doesn’t Work, will be available at the end of April on Pamela S. Harper’s Accelerating Growth podcast series. Powerful Proposals: The Key to Closing More Business, Women in Consulting South Bay Meeting – May 11. We are in the process of booking our Summer and Fall ’09 speaking schedule. If your business or association could use a dynamic, thought-provoking presentation or workshop on marketing or business strategy, please contact us.